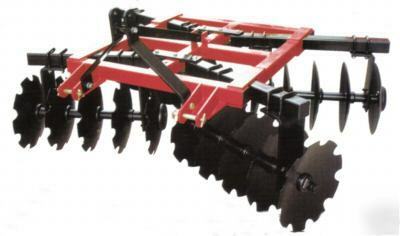 Brand New Ag-Maxx Series 377, 90" Heavy Duty - 3pt Disc Harrow. * Rated for Tractors with Cat 1 - 3pt Hitches. * Compatible with Cat 1 Quick Hitches. * Front & Rear Discs are Notched. * Has (24) - 20" Diameter Discs. * Has adjustable Disc Angle Settings. * This Disc Harrow comes complete & ready to use! * We are glad to say that Ag-Maxx Products are Made in the USA!